When you think of bike-friendly cities, Abu Dhabi doesn't come readily to mind. Neither, frankly, does Istanbul. But the Abu Dhabi-based newspaper The National is trying to give cycling culture a bit of a kickstart in the United Arab Emirates, promoting a ‪#‎CycleToWorkUAE‬ day on 13 January 2015. As part of the paper's coverage ahead of the event, one of its opinion editors asked me to write a piece about efforts to develop a cycling culture in Turkey -- which, despite appearances, have come a long way in the past decade, though there is still much work to be done to make the streets safe for cyclists, not to mention pedestrians and runners like myself. I tip my hat to the intrepid cyclists in both countries, especially those in Turkey who generously shared their experiences and opinions with me. 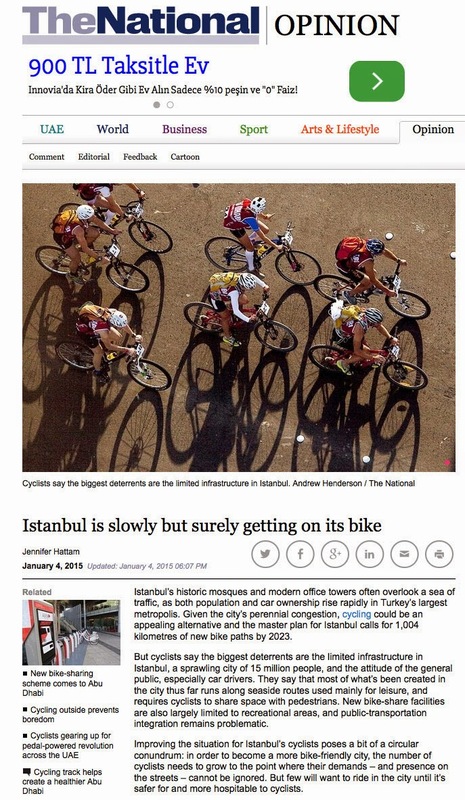 Read my article, "Istanbul Is Slowly But Surely Getting On Its Bike," on The National's website.